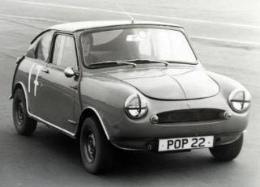 The last of the three New Era Minis inherited the number POP 22 from the first of the Minis. When no finance was forthcoming for production, it languished at the back of the New Era premises for a few years as a rolling chassis with engine and gearbox bolted in position, but otherwise not connected. John MacQueen, a local Mini expert, offered to finish it which was no mean feat as much work was needed. John’s enthusiasm for Mini conversions continued as he later bought the moulds and body shells for another Mini variant, the Codford Mini (see Jeroen Booij’s book). 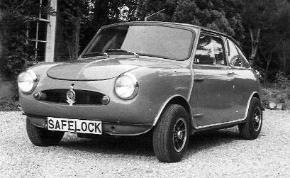 In the late 1960s, POP 22 was used as a demonstration vehicle for New Era security products such as the 'Safelock' steering wheel lock and the car appeared in several exhibitions in the Birmingham area fitted with various security products. In the early 1970s, New Era was not in a good financial position and so POP 22 had to go, but it was bought by Ken Nightingale’s son, Chris. It was used as daily transport off and on, and also occasionally for competition events - the photograph on the left shows it at Snetterton race circuit in Norfolk taking part in a sprint meeting. It was laid up in 1981, first in Droitwich and then in North London. It sat resting for 25 years.